We left Durham with our usual coach driver, Alan Burrell from Barnard Castle Coaches, and by the time we collected a few more members at Darlington we had an almost full coach. Our first property to look around was Chirk Castle, a National Trust castle near Llangollen. We then made our way to our hotel in Betws-y-Coed. The following day we visited the wonderful gardens at Plas Brondanw which is the sister garden to Portmeirion, both being owned by the Clough Williams-Ellis Foundation. We then proceeded to Anglesey to visit the National Trust property Plas Newydd. Unfortunately we arrived in the rain which rather spoilt our plans to see the gardens, but there was plenty to interest us in the house. Day three was our morning to go on the Snowdon Mountain Railway by steam from Llanberis. This was an hour’s ride to the top in a single carriage to ourselves where it was quite misty. Most of us then climbed the steep steps to the very top but unfortunately the mist got worse and we were unable to see what should have been a wonderful view. On our descent we were half way down before the mist cleared and the sun was shining. Following this we proceeded to the privately owned Gwydir Castle at Llanwrst which had been bought and cleverly restored by the young owners. 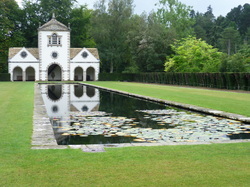 The next morning we arrived at the famous beautifully laid out Bodnant Gardens near Conwy run by the National Trust. We then carried on to Penrhyn Castle, also in the hands of the National Trust, with its gardens and railway museum where, sadly, it rained all afternoon. Our last day was a free morning to explore Betws-y-Coed in the sunshine and then it was on the coach again to Llangollen via the scenic Horseshoe Pass to have a ride on the Canal there. We had a horse-drawn boat to ourselves and it was all very peaceful and thoroughly enjoyable. A few of our group then looked round the town whilst others went to visit a private property called (again) Plas Newydd. Then came the day for our return to Durham but we stopped off in the drizzle to explore the stately Powis Castle, a huge National Trust property, and then it was time for our journey home after a most interesting and enjoyable few days. Our thanks must go to Jacqui Yates for all her time and hard work planning a memorable holiday and to Alan our courteous and competent driver.